With Easter hip hopping its way towards us, we are seeing new spring party clothes in stores that are begging to be worn. Of course, girls are just swimming in wonderful choices with all of those simply delicious sherbet-colored dresses. So many choices for a little girl to find just the right dress for their personality. But what about the boys? I know it’s going to be all about khakis and the blue or white button down shirt–which is a classic staple for boys around the world. 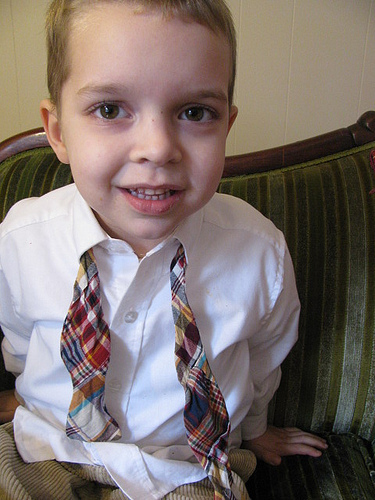 But there is a chance for a bit of whimsy in boys in ties. These ties are a a bit sassier than the average rep tie, and what little boy doesn’t have a bit of sass! Of course, our dear Wolfie has sass aplenty and is sporting a gingham tie from our BFF, Target. What I love about this is that he is sporting a tie and wee sports coat with jeans and sneakers. 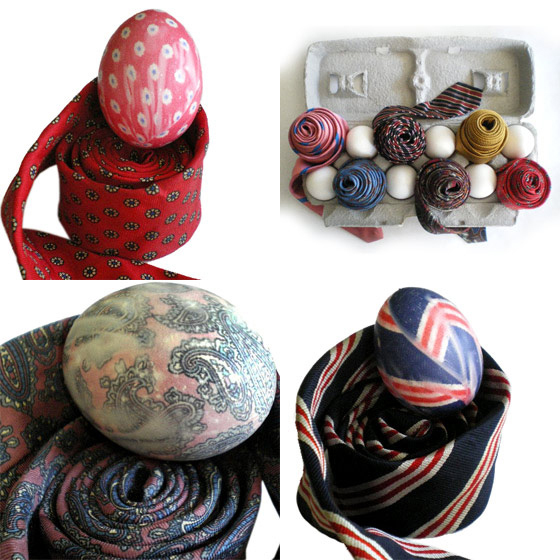 You see, ties can be pulled out for Easter and beyond–just for fun! Me and Matilda has created some of the most adorable springy ties ever! Etsy Seller, ButteredToast has created this insanely charming little bow tie that would easily make the Easter Bunny leave him a little extra chocolate. 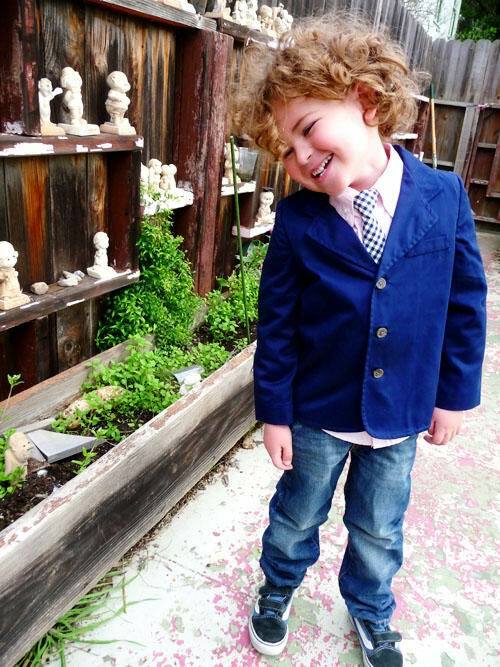 I personally can’t get over how adorable this gold tie looks on a simple denim shirt! What a great idea! And Etsy seller, Emilee Irwin created a matching bow for a little girl’s hair. What a good big brother! And speaking of matching, the Belle and the Beau has taken it to the next step and offering father and son matching ties. I think this might be so adorable that I have to look away for a moment. But only a moment, because is crazytown cute! 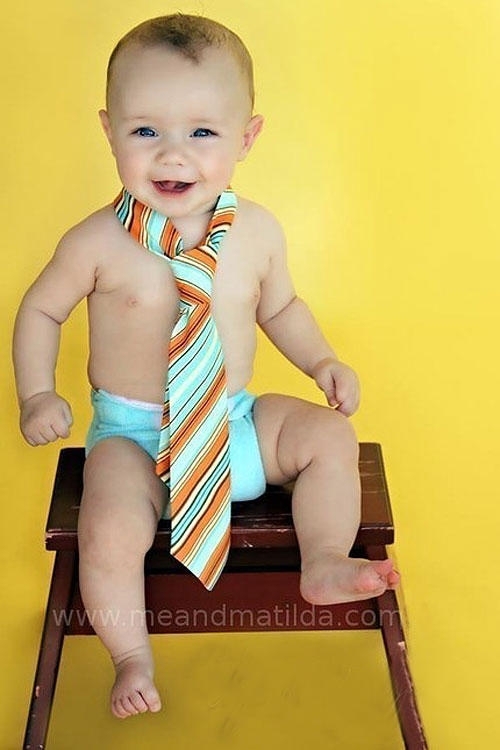 I’ll look back at the other adorable Belle and the Beau ties, like this one and this one. Hint–don’t be shy about choosing the bow tie! They are a snap to tie. Really! Oh, and one last note: for you lucky people in L.A.–leave the PAAS at Walgreens honey, and take this tie-dying Easter eggs class with the dreamy Robert Mahar! Tagged with boy ties, Easter, etsy. Um, who is that HANDSOME little kid at the top??? heehee. This is a splendid post Ms Dottie. I looove it! 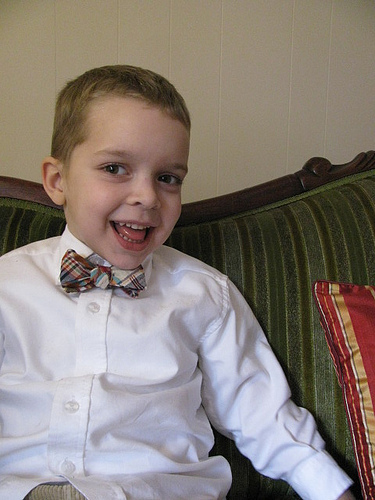 Who doesn’t love a little boy in a bow tie. A grown man? Hmm…. Bow ties today are what bolero ties were in the 80s. HOT HOT HOT! Seriously, what is the deal with Wolfie and the Next Direct Contest– he HAS to win! Everyone needs to go and vote for Wolfie on the Next Direct Facebook page!!! Aw Marla….you are too sweet! !